I was recently told by someone who knows me very well that I conceal my anxiety like a cool cucumber. 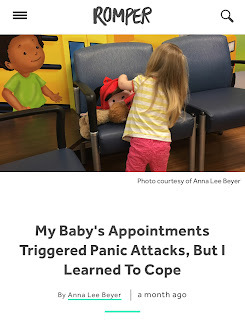 Maybe that's true, and not everyone in the whole world knows I've been struggling with anxiety and panic since Lizzie was born. Well, first, it is getting better. :D I was able to write about it for Romper.com! "I found that staying aware of tangible things around me left less mental space for catastrophizing."